Marilyn Manson recently marked the release his ninth studio album, The Pale Emperor. For those of us who grew up in the shock rocker's heyday, it's sort of insane that he has made it this far. Though his relevance and "shock value" are no longer what they were during the mid-'90s, he's survived and is still making music long after most of us had written him off. The fact that The Pale Emperor is so great ranks among the most shocking tricks Manson has pulled off yet. Manson, to be sure, struggled with aging. When your whole act is scaring people, you have two fundamental issues to contend with as you get older. Number one, what you're doing is not going to be so weird or outside of the box as time goes on. People will top your act and the public will get used to what you're doing unless you somehow can top yourself. Number two is that your fan base grows up. The kids who were in awe of what you were doing are now the parents. Their kids think of you as their parents' music, so they look to something newer and even more shocking. The parents, in turn, quit paying attention because they have bigger priorities. Then, without being able to surprise and without being able to draw attention to yourself with antics, all you're left with is songwriting. That is where most so-called shock rockers fail. When the gimmick is gone, they have nothing left to hide behind and they're exposed for the charlatans they are. It turns out they never could write a song as well as they could market. There isn't a lot of crossover between marketing majors and musicians. This really seemed to be the case with Manson over the last decade. Either he tried to surprise us with new, increasingly lackluster attempts at antics, or he released albums like Eat Me, Drink Me, his supposed "breakup" album, which was so tepid that even his most die-hard fans struggled to accept what they were hearing. That is why The Pale Emperor is so bizarre in the Manson continuum. As the latest chapter of his story, it stands as a triumphant return to the songwriting principles that made him famous in the first place. I'll be the first to admit that I've always questioned Manson's validity as a performer and a songwriter due to the fact that he relies so heavily on gimmickry. But he tapped into something vital in his first go-around. When he was making his name, before he succumbed to the pitfalls of his own identity, he captured a vibe. 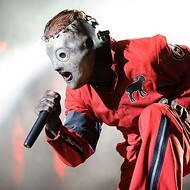 Slipknot Is Back...But Who's Buying? 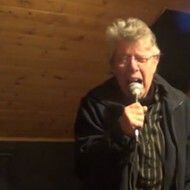 Check Out the Brutal Vocals On This 66-Year-Old "Grindcore Grandma"